For the decorations, I didn’t want to go completely crazy with the franchised party supplies. We did buy the Trolls plates, serviettes and cups, but we decided tablecloths and banners were a little tacky. These can all be purchased at BigW or other party supplies stores. Although there are fewer party supplies you can buy for the Trolls theme compared to more popular ones like Frozen. For the banner, I decided to make my own. I was inspired by Tamarama Studios Trolls party banner on Etsy. To make mine I just purchased some colored paper and sparkly flower stickers from Spotlight. I used original troll doll silhouette to cut out troll bodies and stuck flowers on their belly. I just used some string and mini pegs to pin them up. I was really happy how it turned out. 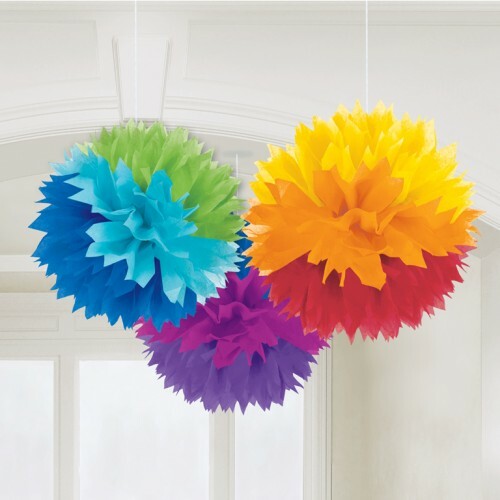 I also bought some rainbow fluffy deco paper balls hang next to the banner. On the table, we decorated when some colorful flowers, a couple of my original Troll dolls and Poppy and Branch dolls from Plush Direct. The vases were decorated with stickers from the Crayola Trolls Color n’ Sticker Book. My cupcake toppers were made from scrapbooking paper flower from the Reject Shop, attached to toothpicks. The magnificent cake was made by Annie from Cat and Fiddle Cakes and Deli Cafe. I trusted that she would come up with something unique and was really happy with the result. I just love the pastel colours, white drip and the gold detailing. She incorporated all our suggestions. Even the Trolls Keychains I bought for the cake look really sparkly and pretty. The inside was a 5 layer chocolate cake with a chocolate mousse and crushed oreos between the layers. It tasted really good! We would definitely book Annie for another party. This year we didn’t end up going with a vegan cake, but Annie also does vegan and gluten free. Something we didn’t realize until we worked out all the details. The cupcakes I made are my vegan Strawberry Cupcakes with Strawberry Jam Frosting that I created for Octavia’s birthday. I made them again using white sugar so that the pink food colouring would colour the sponge. Unfortunately being natural colouring it didn’t make a difference. They still tasted great and I can tell you making them the day before didn’t affect the flavour, if anything it made them a little firmer. My biscuits were made from Chloe’s Vegan Desserts, Vermont Maple Cookies. I didn’t sandwich them with cream like in her recipe. I just added icing sugar. Again, using natural colouring didn’t really come out very vibrant when the icing dried. Although they arent’ as pretty as I hope I am happy I used something more natural. The 100’s & 1000’s are also naturally coloured and free of artifical flavours. These rainbow kebabs were really easy to make. I was a bit hesitant to make them since fruit is usually the last thing that gets eaten. Surprisingly, they were all gone within half an hour. As for the savory items, I decided to not go vegan this year. None of my guests were vegan and I just had one gluten free person to cater for. I did buy the beef rissoles and pork sausages from my local organic butcher. The rissoles were rolled into meatballs and baked in the oven. The sausage rolls were just rolled in puff pastry and baked. My sister-in-law made these amazing Serbian bread rolls stuffed with feta. Probably the least popular option that was leftover was the gluten free dips that I bought. I guess I should have served them before the hot food came out. After we ate it was time for games. The only game we actually got to was killing the Poppy Pinata. This was made by a vendor on Ebay, Pink Poppy Kelly. It was good quality and needed a lot of whacking until she finally broke open. The kids had fun, but poor Octavia didn’t like the idea of hurting Poppy. Other games that we left out for the kids to play were Pin the Hair on the Troll , Find Cloud Guy Activity, Trolls Stuck on Stories Game and giant bubble makers. I hope you enjoyed Octavia’s Trolls Party. Leave me comment if you have any questions or want to share about your own Trolls Party. Looks like a great party. Love the troll bunting! Thanks so much Jill. I actually just blew up a picture that I found on google of the original troll body and then cut traced and cut them out individually. If you would like a copy let me know and I can see if I have any left and send you a copy of it.